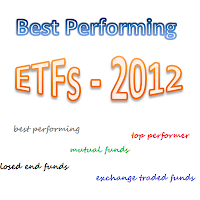 This post is about 25 best performing ETFs 2012 list for September. The top funds are iShares Dow Jones US Home Construction, Market Vectors Egypt Index ETF. Exchange Traded Funds (ETFs) are traded like stocks on stock exchanges (NYSE and NASDAQ). You can buy ETFs online from different brokerages. Compare to mutual funds or closed end funds (CEFs), the ETFs have lower expense ratio. These investment funds are typically traded slightly at a discount or premium to the Net Asset Value (NAV). 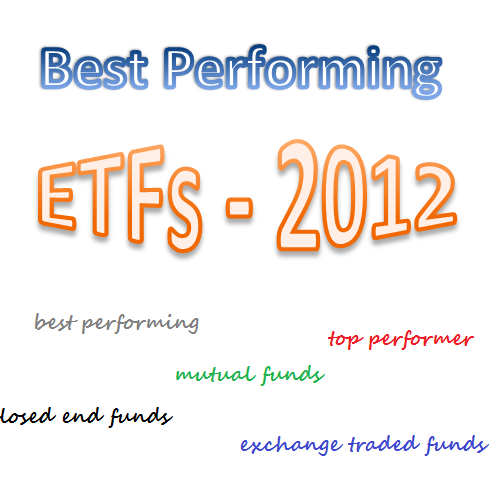 From this best funds list, you may find lots of sector equity funds are the top performers. The top performing sectors include: real estate, emerging markets, commodities, health, etc. You can find the fund performance, expense ratio, and yield or dividend from the table below. iShares Dow Jones US Home Construction Index Fund objective is to track the performance of the Dow Jones U.S. Select Home Construction Index. It has dividend yield of 0.50%. The expense ratio is quite low, only 0.47%. The fund CUSIP is 464288752. The current shares price is 18.82. The NAV price is $18.81. If you have $1,000 funding, you can buy about 53 shares. This best performing fund has a 3-year annualized return of 20.57%. The YTD return is 58.82%. The total net assets are $1.2 billion. The top 5 stocks in its portfolio are Lennar Corp, DR Horton Inc, Pultegroup Inc, Toll Brothers Inc, and NVR Inc. This Market Vectors Egypt Index ETF is part of Van Eck Global ETFs. This stock ETF invests in stocks of Egypt companies. This fund invests mainly in medium and small capitalization companies. The fund’s commencement date is February 16, 2010. You can also trade options of this ETF. The net expense ratio is 0.94%. It is traded on NYSE Arca. The top performer ETF has a year to date return of 58.67%. The top 5 equity sectors are diversified financials, materials, banks, real estate, and telecommunication services. iPath Dow Jones UBS Grains Total Return Sub-Index ETN utilizes its assets to purchase futures contracts on physical commodities comprising the Index. The total shares outstanding are 2.7 million. The latest shares price is $63.36. This exchange traded note has 20-day volume average of 28,047. The yearly fee is 0.75%. In term of fund performance, this best performer fund has a 3 year average return of 19.89%. For 2012, the YTD market return is 40.71%. The top 3 sectors are soybeans (40.38%), corn (32.19%), and wheat (27.43%). SPDR S&P Biotech ETF focuses its assets in biotechnology companies. You can buy this ETF from your brokerage. The primary benchmark is the S&P Biotechnology Select Industry Index. This State Street Global Advisors ETF has 5 year average performance return of 12.61%. As of September 2012, the top 6 stocks in its holdings are Pharmacyclics Inc, Onyx Pharmaceuticals Inc, Affymax Inc, Arena Pharmaceuticals Inc, Ariad Pharmaceuticals Inc, and United Therapeutics Corp De. The net asset value (NAV) per share is $92.02. The beta risk vs S&P 500 index of this top performing fund is 1.12.